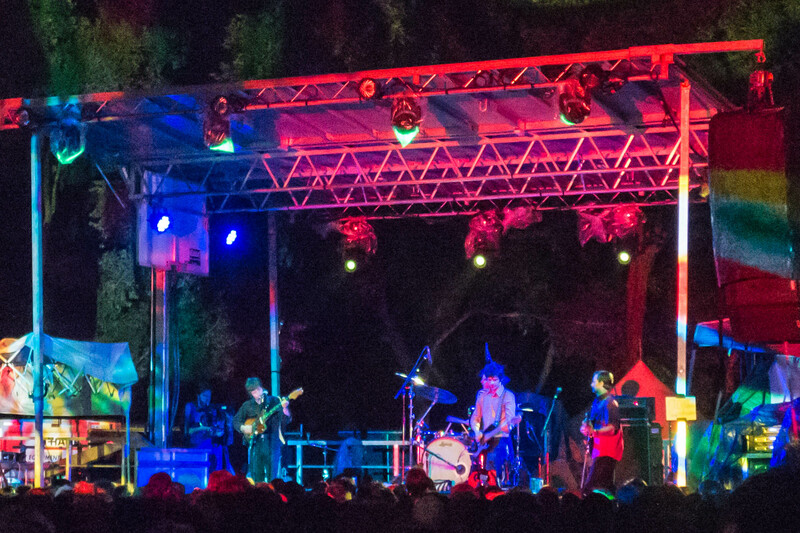 It had rained so much earlier in the week (and earlier in the day) that the organizers of Levitation — this year’s version of the Austin Psych Fest — had to change stage locations. The desire was to have no band float off into the river as the stage they played on was swept away, though that sure would have been cool to witness. But even though they provided a helpful pocket map, with set times on the three stages, the reality of the layout did not conform to what was on the map, and thus we were more than a little disoriented Friday evening. And of course, the quicksand texture of the ever-present mud made getting from one stage to the next an adventure. Going to an event like Levitation, with headliners including The Jesus and Mary Chain, Tame Impala, Spiritualized, the Flaming Lips, Primal Scream, and the reunion of the 13th Floor Elevators, you have to pick and choose who you really want to see, which is a function both of desire and stamina. 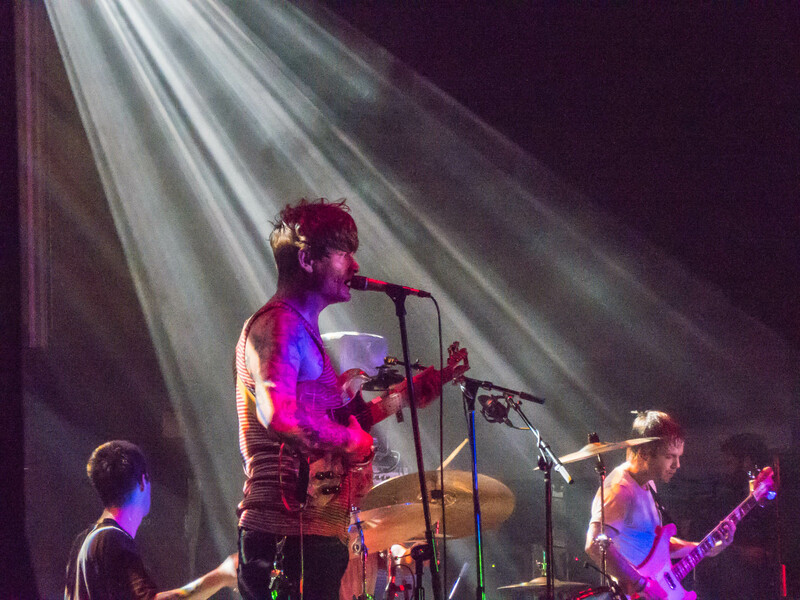 For us, the priorities were to see Thee Oh Sees, White Fence, and the Black Ryder — three fave bands from the West Coast who non-NYC East Coasters are deprived of. It really was these bands that we flew to Austin to see, as among the headliners, we’ve seen The Jesus and Mary Chain many times over the years, and Spiritualized on their last tour. Much as we would have loved to have seen Roky Erikson play to a hometown crowd, the 13th Floor Elevators reunion was late Sunday evening, and in order to be at work this morning, banging out this Tulip Frenzy update, we needed to be on a return flight well before he beamed down on stage. So we picked and we chose and the best of what we saw is contained herein. We loved Holy Wave, who played early Friday evening on the stage they’d moved up from rivers edge. 2014’s Relax was a garage band highlight, and their evocation of the Velvets meet Spaceman 3 seemed a perfect way to get into the Levitation spirit. On a beautiful evening, with the rain gone but not forgotten, we stood by a suppurating mud hole and saw these Austinites (transplanted from El Paso), ring true to a Texas-state tradition that includes ? and the Mysterians, not to mention the Sir Douglas Quintet. Fun set by a great band whose new work, previewed here, seems both poppier and tighter than what was on Relax. Great things await these guys. Longtime readers will remember that Tim Presley in his many guises — Darker My Love frontman, co-conspirator with Ty Segall, genius leader of White Fence — is accorded worshipful respect at Tulip Frenzy World HQ. White Fence’s Live In San Francisco was on 2013’s Top Ten List, and of course, For The Recently Found Innocent was our Album of the Year last year. So to say we were looking forward to White Fence’s set is an understatement, and we are happy to announce they did not disappoint. No, if anything, they exceeded our sky high expectations. From the opening strains of “Paranoid Bait” to the Ian Rubbish-perfection of the closer “Harness”, the White Fence set was scorching, with the guitars chiming perfectly, the drummer damn near pounding this stage back into the river. If you believe, as we do, that the Holy Troika of Ty Segall, John Dwyer, and Tim Presley have saved rock’n’roll in the same way, beginning in ’76, that punk saved it, then you will understand we are not exaggerating in our verdict that the elusive Presley and his incredible live outfit are the most interesting act in contemporary music. This is not easy music to perform — there’s a Magic Band complexity to the hairpin turns and manic galloping of songs like “Wolf Gets Red Faced” and “Paranoid Bait,” and in context, the motorik “Baxters Corner” was a psychedelic anthem. Presley is emerging as a towering American musical figure of Alex Chilton-esque importance, and the set White Fence played Friday night alone was worth the airfare. It also made us replay in the hours since the 2013 live album, and yeah, it’s on a par with Live At Leeds, it really is. Our fervent prayer is that Presley sustains the focus that brought us that live album and last year’s opus, and does not go back to noodling in his room. If we had our druthers, he would take this band into the studio and lock the door. We’d slide cheeseburgers under the door and eagerly await the output. 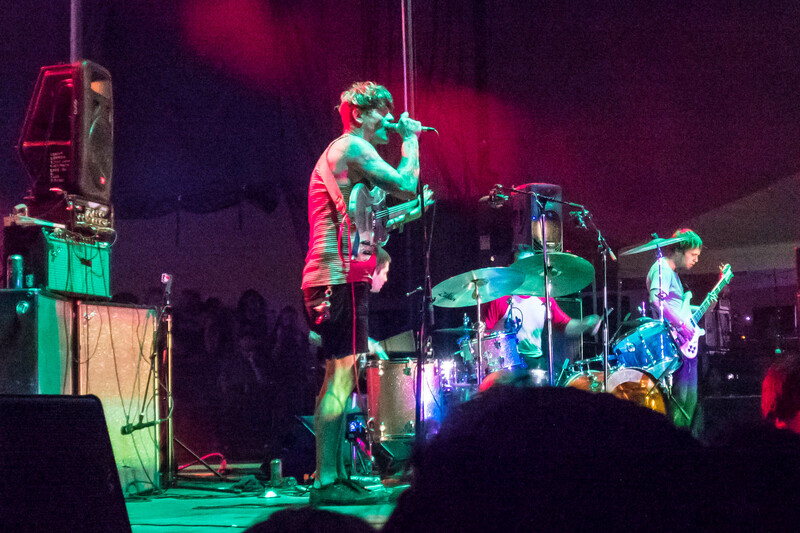 Our second favorite set of the festival was Thee Oh Sees on Saturday night. 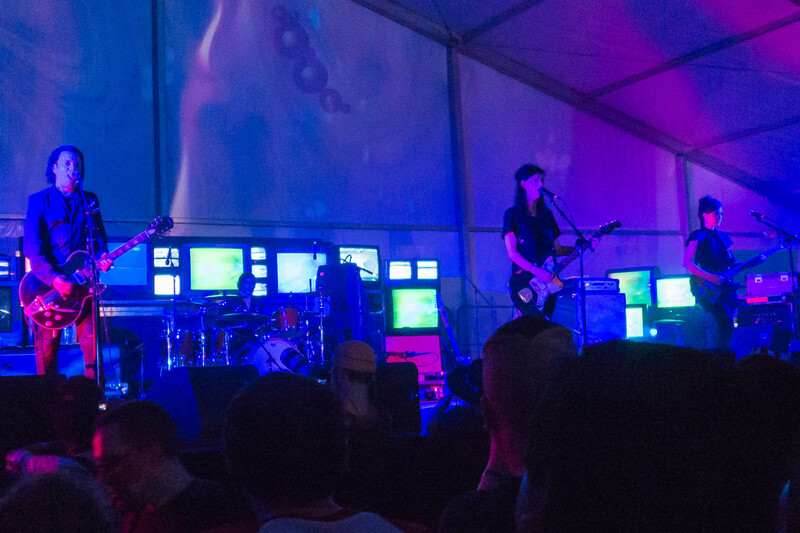 We fought our way forward through the large crowd of the Reverberation headliners’ stage, and man, were we rewarded. The double-drum set up of the new construct was potent, though it must be said that an aspect of melodic subtlety has been dropped in the transition from the San Francisco to LA lineup of Dwyer’s outfit. On songs like “Web,” which they performed gloriously, it appears that when Mutilator Defeated At Last is released in a few weeks, some of what we loved so much about 2013’s Floating Coffin — the ability to both startle the senses and tickle the frontal lobes, all at the same time — will have given way to brute force thundering punk. But that’s high praise in many a home, not least ours, and we were thrilled by the generous set Dwyer and co. played. 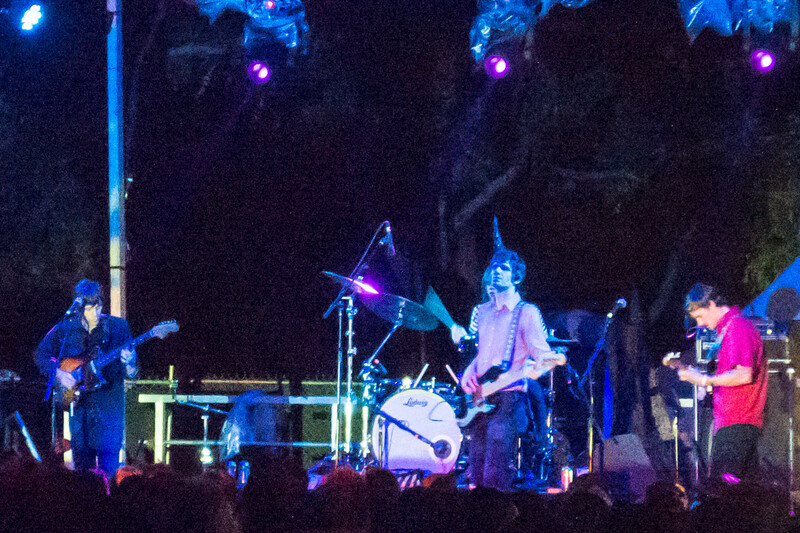 So we were a little disappointed by the Spiritualized set Friday evening. But while, as we will explain, it’s not entirely fair to judge The Black Ryder based on their Saturday performance, we think maybe it’s time to offer a heart-to-heart, avuncular download of advice to one of our very favorite bands. The problem of unfairness they faced was that they were squeezed into the smaller stage inside the tent next to where Thee Oh Sees would perform thirty minutes after their set began. It was inevitable that the crowd — us included — would drift away to see the bigger band on the bigger stage. But the additional problem is that the three songs they began with from 2015’s The Door Behind The Door are all slow, and while beautiful, 20+ minutes of music at that tempo was not what a festival crowd wanted to hear. The moment they began playing music from their earlier masterpiece, 2010’s Buy The Ticket, Take The Ride, things improved, for these are far more uptempo songs. The early segment from the new album happen to be the best things on the disk, and if this is an indication of where The Black Ryder are headed, we get it, we accept it. But we have to say we were a bit disappointed with the set, and yeah, on balance, with the new album, in part because we miss the Bloody Valentines meets Morning After Girls ecstasy of the first one, in part because the new music is a tad precious. 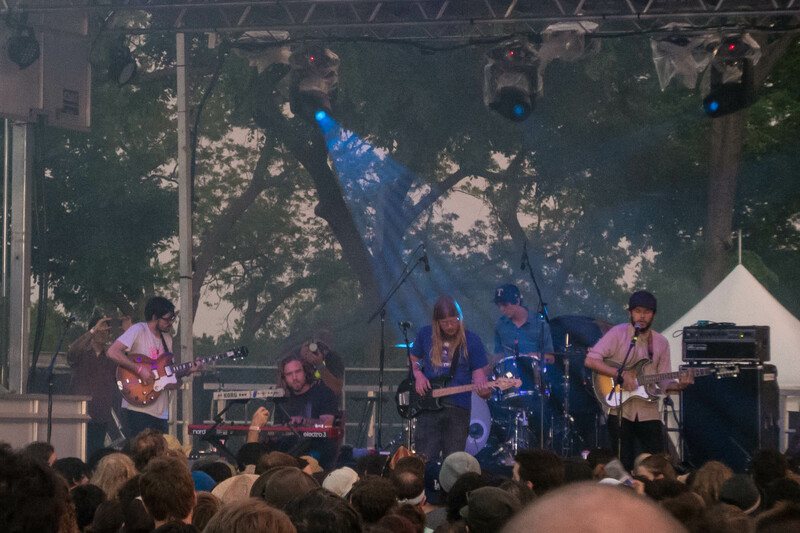 Growing pains suffered by a great band, who at Levitation were dealt a cruel hand. Given they were inevitably going to lose a portion of the audience to Thee Oh Sees, we wish they’d paced their first 35 minutes a bit differently. And we look forward to seeing them play a full set, at the pacing they choose, anytime they can return, we hope as headliners, to a longer East Coast tour. All pictures taken with the Leica C.
This entry was posted on May 11, 2015 at 2:54 pm and is filed under Uncategorized with tags Holy Wave, Levitation, The Austin Psych Fest, the black ryder, Thee Oh Sees, White Fence. You can follow any responses to this entry through the RSS 2.0 feed. You can leave a response, or trackback from your own site.